Our top-priority is keeping West Springs, Cougar Ridge and Wentworth residents informed. All the community’s must-know news is easily accessible through the West Springs, Cougar Ridge and Wentworth community newsletter, which is published monthly so that residents are kept current on relevant community and Calgary news. 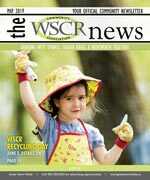 The WSCR News is delivered monthly to every household, apartment, and business, and is a great way to get hyper local advertising exposure. The West Springs Cougar Ridge Community Association serves an everincreasing population, representing one of the fastest growing communities in Canada with a rich mix of cultural diversity, abundant natural parks and green space, recreation facilities, and shopping and services of all kinds at our Community Core. The Association is a not-for-profit body that has proudly served the residents of our community for the past 10 years and is run by a group of dedicated volunteers. The scope of our work revolves around many issues in our community including development, transportation, parks and green space planning, plus recreational and educational programs for all ages. In the City of Calgary's 2012 municipal census, Cougar Ridge had a population of 5,874 living in 1,908 dwellings, a 1% increase from its 2011 population of 5,813. With a land area of 2.2 km2 (0.85 sq mi), it had a population density of 2,670/km2 (6,920/sq mi) in 2012. For more detailed info visit the City of Calgary community profiles site.